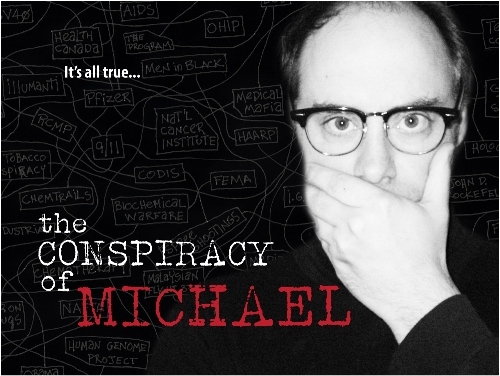 The Conspiracy of Michael is an innovative piece of theatre that wrestles with the hot buttons of conspiracy theories and grief. As one of the mini-Gallery shows, it will draw the audience into a close-up and intimate window to the troubled fragments of someone else’s life. Performed at b contemporary gallery for the 2014 Hamilton Fringe Festival Mini-Gallery Series (July, 2014). “Murder, Sherlock, sci-fi and paranoia at The Fringe” by Gary Smith; The Hamilton Spectator, July 18, 2014. Check out the feature review in Hamilton Spectator about our production of The Conspiracy of Michael. Raise the Hammer.org REVIEW: “Starts with wide-open potential and then turns around an ever-shrinking radius as it progresses toward a deeply personal conclusion… the restrained emotional intensity between [Near] and his [co-star Repei] focuses and humanizes.” Check out the feature review at Raise the Hammer.org of The Conspiracy of Michael. Read more about the development of The Conspiracy of Michael on the Hamilton Fringe Festival BLOG.